Joe Hashey, CSCS, is an accomplished strength and conditioning coach and a published author of several articles. He is the owner of www.synergyathletics.com. I'm pleased to have this opportunity to interview him so that I can share his knowledge with my readers! JOSH: Joe, can you tell us a little about yourself and Synergy Athletics? JOE: My name is Joe Hashey, and I’m a training addict. Sounds like a self help group! Here’s the deal, I went to Colgate University to play football and I got injured – four knee surgeries – and then I got fat and lazy for about half a year. I knew it was time to turn it around so I jumped into the gym, cut down from my playing weight of 310 to 250, and increased all my lifts! I spent most of my time buried in strength training books, despite being a Political Science major, and eventually earning my Master’s in education. After college I started teaching high school and coaching football and baseball. I figured it was time to spread some of the things I learned, so I studied and earned my CSCS. Shortly after the certification, I opened a garage gym for athletes – Synergy Athletics. I will summarize Synergy Athletics briefly. We bring it every day. If the athlete can’t bring the hard work, then I ask them to leave. Fortunately, this method has helped breed some intense and successful athletes! Oh, and I don’t want to sound like a jerk – it doesn’t really matter how MUCH the person can lift when they first come, it matters HOW they lift. Is it with intensity? Do they listen to instructions? Do they use proper form? JOSH: If can you summarize it, how would you describe your training philosophy in general? JOE: I would call it a strongman/powerlifting hybrid style. Don’t get me wrong, I enjoy Olympic lifts myself, but the time I spend with each athlete is so limited compared to the big picture – school, homework, social, training, more social, etc. Their gains would be very limited if I spent 3-4 weeks instructing oly lifts. So I turned towards strongman and powerlifting. You can still achieve significant rate of force development using dynamic effort movements – throwing, jumping, DE (Dynamic Effort) primary lifts. JOSH: Sounds excellent... we use a similar system of training at Team Barbarian Strength Athletics.You are known for your use of odd implements to develop ‘real world’ strength for athletes.If you had to choose, what would you say are your favorite 2 or 3 “unconventional” exercises? JOE: I love odd objects. They add extra aspects of strength while helping people achieve a "blue collar" attitude. Anything with a thick rope. Grip is often overlooked in sports. A thick rope will expose that weakness in a hurry! Climbing pull ups, thick rope battling, heavy sled rows, and climbers are all great choices. Sandbag Hand Grenades. 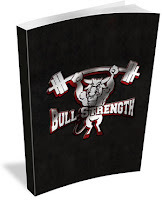 This is an exercise from the Bull Strength Manual. It is competitive and fun as well. The athletes stand facing sideways with a bench between them. One of them has a heavy sandbag at their feet. That athlete must pick up the bag and throw it over the bench (leg, core, rotational, grip, and back strength). The other athlete has 3 seconds to throw it back or he/she “blows up.” We go for a time limit or until there is a winner. JOSH: Sounds like fun, as well as incredibly tough! What are the most common mistakes you see people make when they begin a strength training program? JOE: The biggest mistake is no direction. How much volume, what’s your split, do you have a restoration plan, which exercises are you going to test? These questions need to be answered! The second biggest mistake is being a sissy. JOSH: Haha, I'd have to agree on that point. Thanks for your time, Joe! Is there anything else you would like to add? Also, if anyone wants to learn more about your training, where can they look? JOE: Always a pleasure Josh. I would appreciate it if people would go check out my strength training blog over at http://www.synergy-athletics.com . Right now I am offering 4 free newsletter bonuses and about to send out the 5 Ways To Increase your Squat bonus article after the next 8 people join the list! Get on board and participate in our community! Thanks for the read guys, and thanks for having me on Josh. i always make that second mistake! one day i'll learn how to stop that! Who Are The Strongest Guys In Ontario?